Is Karbonn A1 a good phone? Does it have dual sim or not? I want to buy a touch screen type good mobile within a small budget. I heard that Karbonn A1 is a very good touch screen mobile available in the market with affordable price range. Do you have any experience about Karbonn A1? Is it Dual sim or single sim? Full touch screen? Do you have any price indication? Karbonn A1 is one of the most popular handset in India. 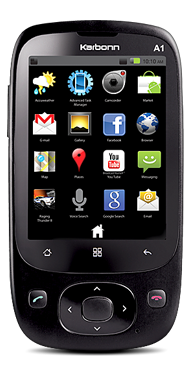 Full touch android 3G phone within small budget. It has 2.8 inch TFT Touchscreen display, Wi-Fi, 3.2MP Camera, Handwriting recognition, Media Player, Social Media Apps, Bluetooth, Java, GPS, G-Sensor and above all upto 32GB expandable memory card support. It's a single sim phone. You may find Karbonn A1 at your nearest mobile shops within INR 5000.00. Battery backup very poor, only 3-4 hours for much busy users. Though it's a good deal to find such a feature enriched mobile with such a low price. You can get it for as low as INR 4500-4800. Mobile prices are going down day by day. Check before buy. Wow, what a phone, so many features within INR 5000. Wish I could have one instead of my old one. It looks gorgeous also. As I know, this phone is a bit problematic. Some users are complaining that the speaker is not working well. If you can give a little more money go for an HTC, there are not such expensive phones and you will be satisfied with their performance. HTC models are much high priced in India. And why not we use our Indian mobiles? Karbonn is a 100% Indian products. Though, there may be some minor problems, but we should buy and use Indian origin products to encourage the entrepreneurs of our beloved country.